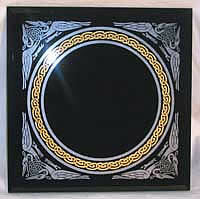 Handsome black scrying mirror on clear glass with finished edges for the Celtic Seer. Pewter colored Celtic Zoomorphic birds & copper colored Celtic knot designs circle the scrying area. Display stand not included. 8" square.